Predation on juvenile salmonids (Oncorhynchus spp.) during out-migration to the Pacific Ocean is considered potentially limiting to the recovery of anadromous salmonid populations from the Columbia River basin that are listed under the U.S. Endangered Species Act. We examined the potential benefits of reducing avian predation associated with five colonies of piscivorous waterbirds in the Columbia Plateau region for three evolutionarily significant units (ESUs) of Chinook salmon (O. tshawytscha), one ESU of sockeye salmon (O. nerka), and two distinct population segments (DPSs) of steelhead trout (O. mykiss) from the Upper Columbia River and Snake River basins. Using predation rate data based on recoveries of smolt passive integrated transponder (PIT) tags at bird colonies and the framework of a simple deterministic, age-structured, matrix population growth model, we translated potential changes in smolt survival due to reductions in avian predation into increases in the average annual population growth rate (lambda) at the ESU/DPS level. Estimates were produced for a range of reductions in avian predation and for a range of levels of compensatory mortality. The greatest potential benefit from reductions in predation by birds from a single colony in the Columbia Plateau region was for Upper Columbia River steelhead when predation by Caspian terns (Hydroprogne caspia) nesting at Goose Island (in Potholes Reservoir near Othello, WA) was reduced; up to a 4.2% (hatchery-raised smolts) or 3.2% (wild smolts) increase in lambda was possible if predation were completely eliminated and compensatory mortality did not occur. Potential benefits for Snake River ESUs were lower, in part because significant portions of those ESUs are transported and thus inaccessible to avian predators in the Columbia Plateau region. The greatest potential benefit possible for a Snake River salmonid ESU/DPS resulting from reductions in predation by birds from a single colony was for steelhead, if predation by Caspian terns nesting at the Crescent Island colony (near Pasco, WA) was eliminated (0.5% increase in lambda if no compensatory mortality occurred). 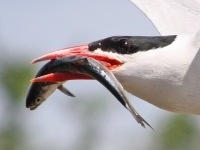 Management to reduce predation on salmonids by Caspian terns nesting at the Goose Island colony would offer the greatest benefits per managed bird. Management to reduce predation by Caspian terns from two other colonies in the Columbia Plateau region (Crescent Island and the Blalock Island Complex) would provide the next largest incremental benefit. Adding reductions in predation by double-crested cormorants (Phalacrocorax auritus) nesting on Foundation Island (near Pasco, WA) and gulls (Larus spp.) nesting on Miller Rocks (near Maryhill, WA) to reductions in Caspian tern predation would somewhat enhance benefits to salmonids, but at a much lower marginal benefit rate per managed bird. Cumulative potential benefits for eliminating predation by birds nesting at all five colonies in the Columbia Plateau region considered here were generally comparable to estimates of benefits from dispersing approximately two thirds of the large Caspian tern colony in the Columbia River estuary (USFWS 2005); benefits were greater, however, for Upper Columbia River steelhead from eliminating predation by birds nesting at the five Columbia Plateau colonies. Our analysis indicates that, at current bird colony sizes, actions to reduce avian predation on juvenile salmonids in the Columbia Plateau region will not by themselves recover any ESA-listed population of anadromous salmonids. Reductions in avian predation in this region could, however, result in increases in salmonid population growth rates comparable to some other salmonid recovery efforts in the Columbia Basin, particularly for Upper Columbia River and Snake River steelhead populations.